This benchmark provides data, ground-truth and code for quantitative evaluation of left atrial segmentation algorithms. The left atrium is clinically important for the management of atrial fibrillation in patients. MRI and CT are commonly used for imaging this structure. Segmentation can be used to generate anatomical models that can be employed in guided treatment and also more recently for cardiac biophysical modelling. There are several anatomical variants and this means that segmentation of the endocardial boundary and pulmonary veins is challenging. The benchmark was launched as part the STACOM'13 workshop, in conjunction with MICCAI'13. The benchmark includes 30 CT and 30 MRI dataset. Ten data sets for each modality are provided with manual segmentation for algorithm training. However, other datasets maybe be used for training. The other 20 data sets per modality are provided for testing. The datasets were provided by Philips Technologie GmbH, Hamburg, DE, and King's College London, London, UK. Tobon-Gomez C, Geers AJ, Peters, J, Weese J, Pinto K, Karim R, Ammar M, Daoudi A, Margeta J, Sandoval Z, Stender B, Zheng Y, Zuluaga, MA, Betancur J, Ayache N, Chikh MA, Dillenseger J-L, Kelm BM, Mahmoudi S, Ourselin S, Schlaefer A, Schaeffter T, Razavi R, Rhode KS. 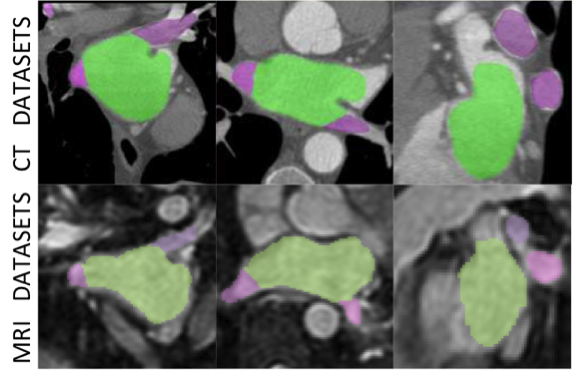 Benchmark for Algorithms Segmenting the Left Atrium From 3D CT and MRI Datasets. IEEE Transactions on Medical Imaging, 34(7):1460–1473, 2015. The data agreement for CT datasets expired on September 2018. Therefore, we can not share these datasets anymore. The code to run the benchmark can be found in this GitHub repository. The algorithm should segment the LA including a short part of the LA appendage (LAA) plus the proximal sections of the pulmonary veins (PVs). The LA body should reach into the funnel of the MV. The input for the benchmark is a single value binary mask in mhd format. The benchmark assumes the mask and original image are registered in the same space. Make sure the mask and the original image match in orientation using visualisation software (e.g. ITK- SNAP, Paraview). In order to obtain a set of ground truth (GT) segmentations consistent across modalities, we started by performing an automatic model-based segmentation with a method optimised for both CT and MRI modalities [Ecabert et al., 2011], [Manzke et al., 2010]. After the automatic segmentation, manual corrections were performed. Performing an unbiased evaluation of different LA segmentation algorithms is not a trivial task. Even for a human observer, defining certain regions of the LA is difficult (e.g. the MV plane, the PVs and the LAA). To ensure that the calculated metrics are not negatively affected by inconsistent definitions of these regions, we developed a standardisation framework. The standardisation framework is executed both on the ground truth and the automatically segmented binary mask.